Would you believe that American Honda, the powerhouse that sold a record 1.5 million vehicles across the Honda and Acura brands in 2015, got its humble roots selling just motorcycles out of this small office space in Los Angeles? 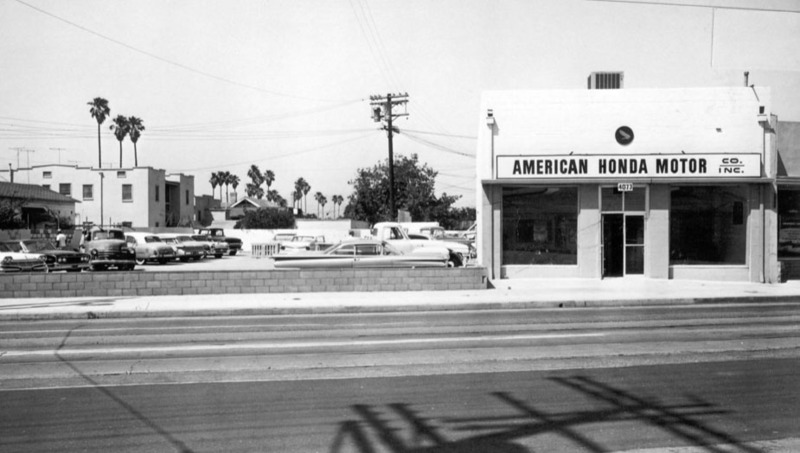 Some 57 years ago, here at 4077 W. Pico Boulevard, the company first took root in the United States, but it has forever since changed the landscape of the powersports and automotive industries. Today, that same office space has changed hands probably more times than one could count, and is currently leased by an acupuncture & wellness facility. Sadly the condition has deteriorated substantially and the neighborhood isn’t all that great. I happened to be in the area yesterday morning so I stopped by for a pre-sunrise photo. The building is available for lease, and it would sure be a lot of fun to move in and create a museum or replica of the way things used to be. Dreams. 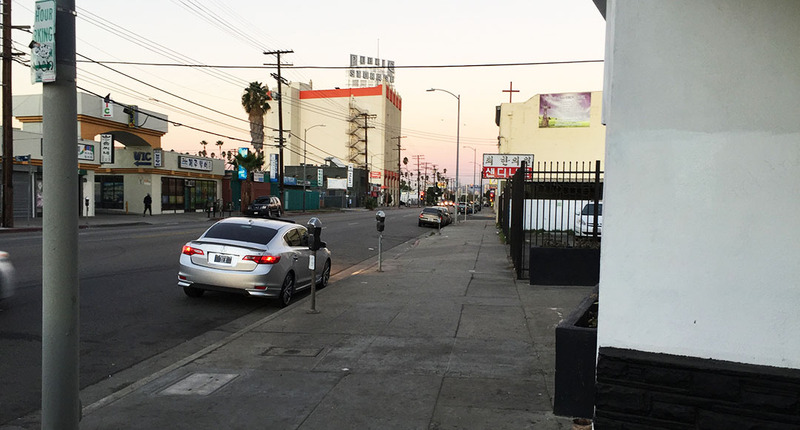 Looking westward down Pico Boulevard. The roads were surprisingly quiet at this hour. 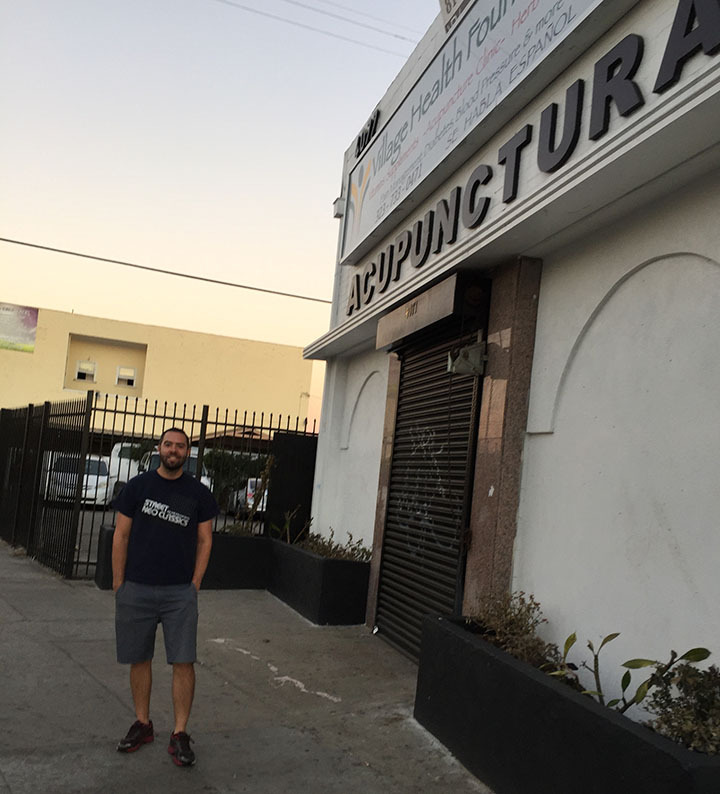 Thanks to the lady selling tamales on the street next door for taking this quick shot of me. 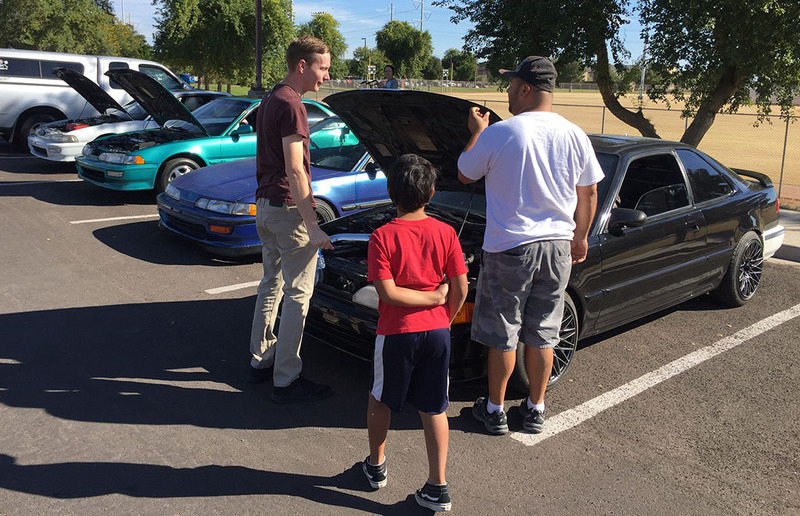 Last Sunday, I met up with a few fellow second-generation Acura Integra drivers at a park in Tempe, Arizona for a little meet & greet. Now 26 years old, this bodystyle has aged pretty well and the few that survive are in the hands of enthusiasts like the handful of guys I met that day. It seems most people consider the Integra a blank canvas upon which to express his or her own sense of style, but I’ve decided to keep mine original to its 1992 factory configuration. It’s always fun to meet with other car-nuts at events like these. Especially in cases, like this one, where the host brought out Dunkin Donuts to share with everyone. Thanks to German for that! 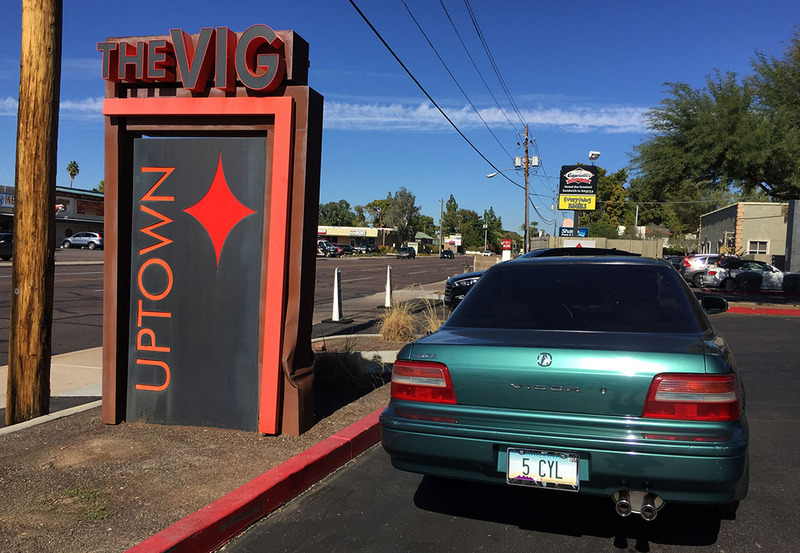 For years I’ve waited for the right opportunity to take a photo of my “Vig” at “The Vig.” The Vig is a restaurant on 16th Street in central Phoenix that has some of the best brunch in the valley. 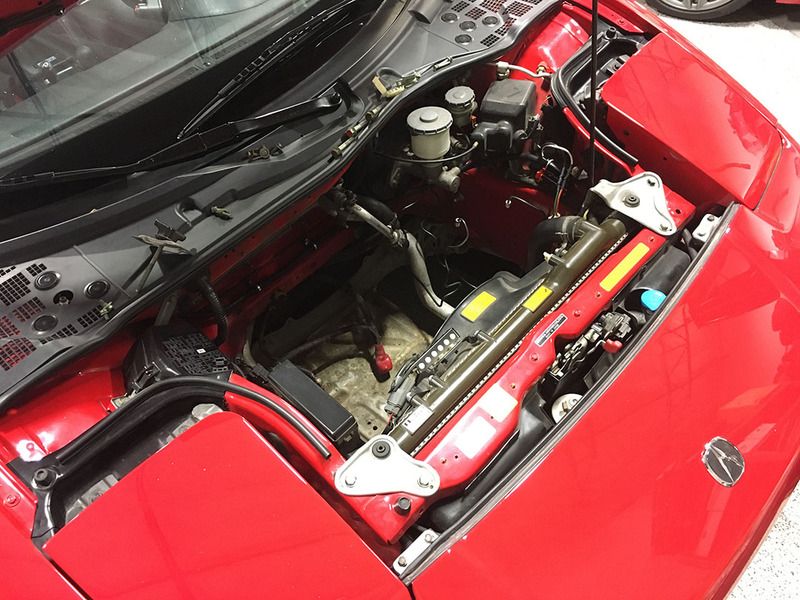 The 1992 NSX has been under the knife for the past week or so, getting a completely refreshed Anti-Lock Braking System (ABS) to rectify a warning light that’s been showing up for a long time. Braking performance under normal circumstances have been unaffected, but the ABS is deactivated when the light is on. 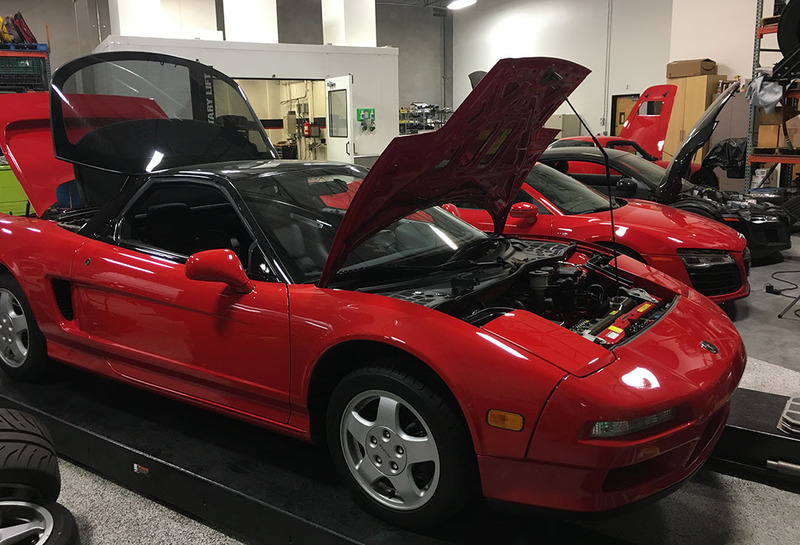 This is a very common issue for the early NSX models like mine, and luckily Science of Speed offers an upgrade kit designed specifically for this application. It involves retrofitting the later model year (2002-05) NSX components. I’m picking up the car the first part of this coming week. SOS did also recommend a few other maintenance items that will wait until my next major “90K” service coming up in 4 years. The timing belt and water pump were changed in January 2011 under the previous owner’s ownership, so they aren’t quite due yet. That was a $2,200 service at the time. For having driven the NSX 26,000 miles in the 5 years I’ve had it, it’s actually been relatively inexpensive to own & maintain. GEICO did just raise my 6-month premium to $179 because the street address at which I now reside is higher risk. Interestingly enough, the NSX is still far cheaper to insure with full coverage than the 2013 ILX (which comes in at over $300) even though the NSX is certainly worth much more. This weekend’s travels took me to California on Thursday afternoon. The Los Angeles Auto Show kicked off last week with Media Days being held on Wednesday and Thursday. Typically, I would have been there as a journalist with the Redline Reviews team to cover the event’s new car reveals, but my work time-off situation wouldn’t quite allow for it. 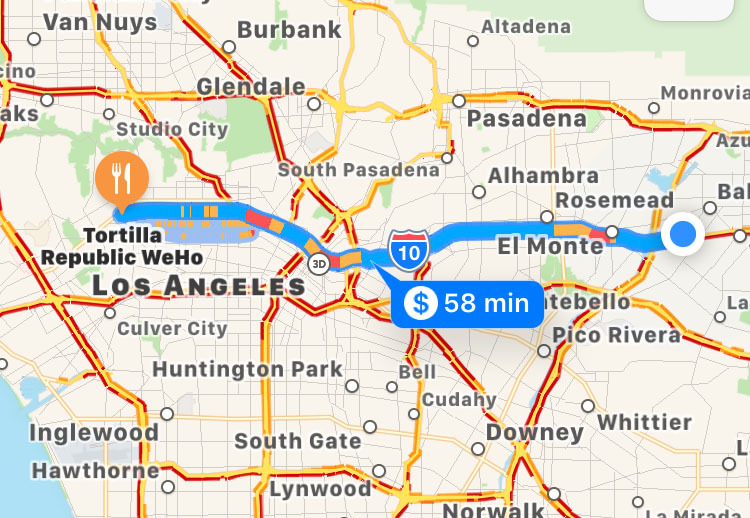 Still, I was determined to participate in the after-hours stuff so I set out in the afternoon for what should have been a six-hour drive to Hollywood for a dinner engagement with about 30 other people. Lucky for me, I also gained an hour due to time zones because that drive in reality ended up taking over 8 hours. Construction zones in multiple places on Interstate 10 and the expected LA rush-hour traffic made for slow going. 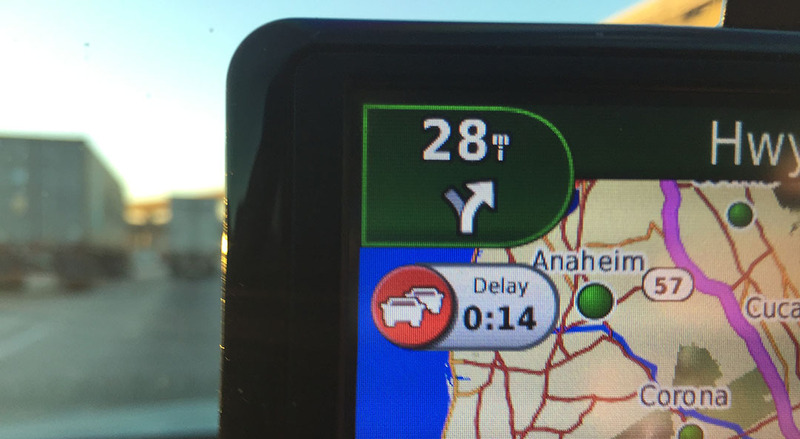 My Garmin Nuvi GPS unit crept up its ‘delay’ timer the closer I got to my destination. At least red is a pretty color! I did finally make it to the venue at “Tortilla Republic,” though, and just 15 minutes before it started. 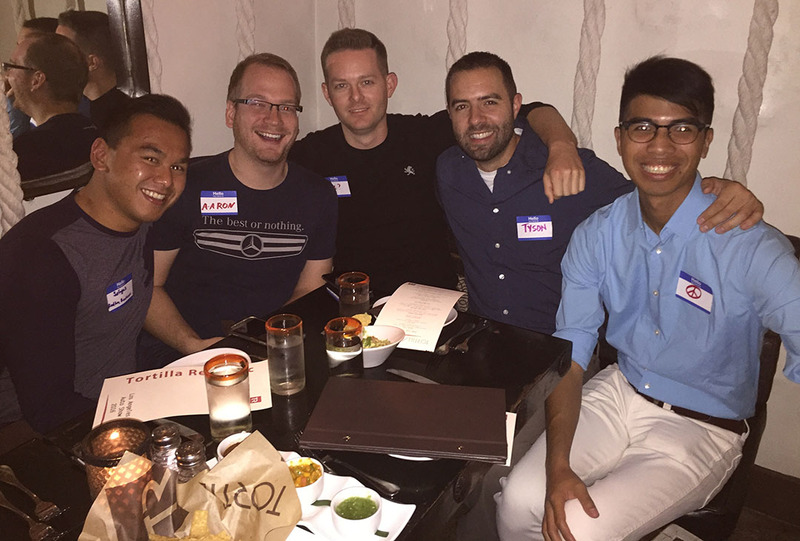 Here, I’m pictured with Sofyan, Aaron, Rob, and Peace who are the backbone of the Redline media group. I’m hoping to partner with them in two months at the Detroit Auto Show if I can play my cards right with the time-off request. Cross your fingers! 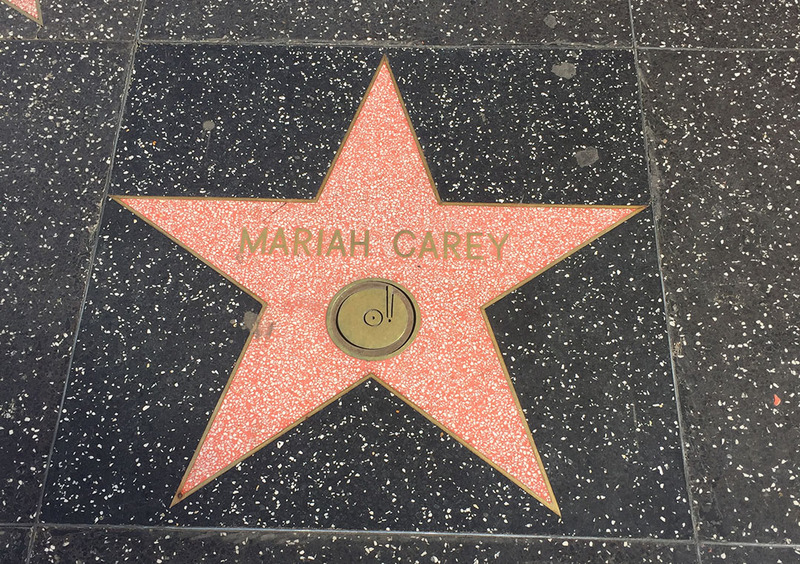 Hollywood’s “Walk of Fame” is home to 2,500 stars like this in the ground. It was walking distance from my motel and I happened to snag a picture of one of the stars, Mariah Carey’s, while en route to breakfast on Friday morning. I made one major pit stop on the way home, to see some friends in Palm Springs. Scott & Sandy are a couple who I’ve featured on the blog previously. Their ever-evolving automotive collection spans a wide variety of tastes, from their 1992 NSX to a 1980s Mercury Bobcat (rebadged Pinto), to their latest: a 1964 Mercury Park Lane which they just had brought over on a transport truck from Houston. It’s waiting for some brake work so we didn’t take it for a spin, but those guys sure have some great taste in cars! 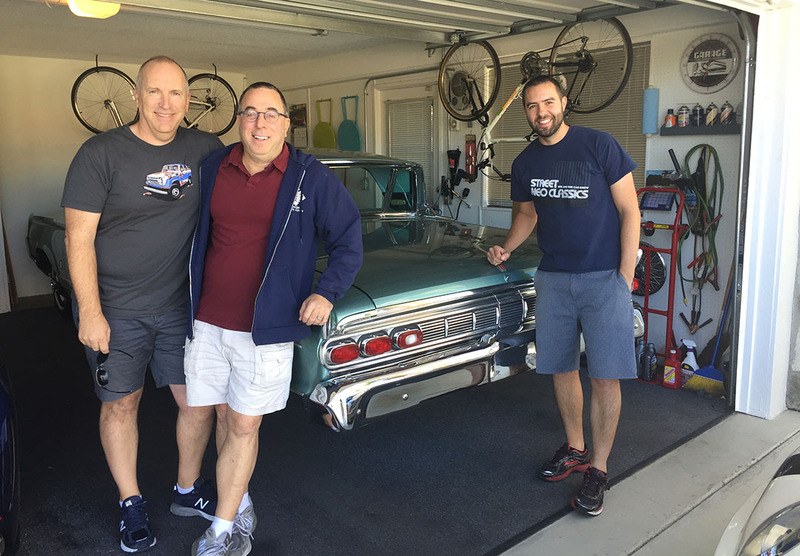 I took a spin in their 41,000-mile (!) 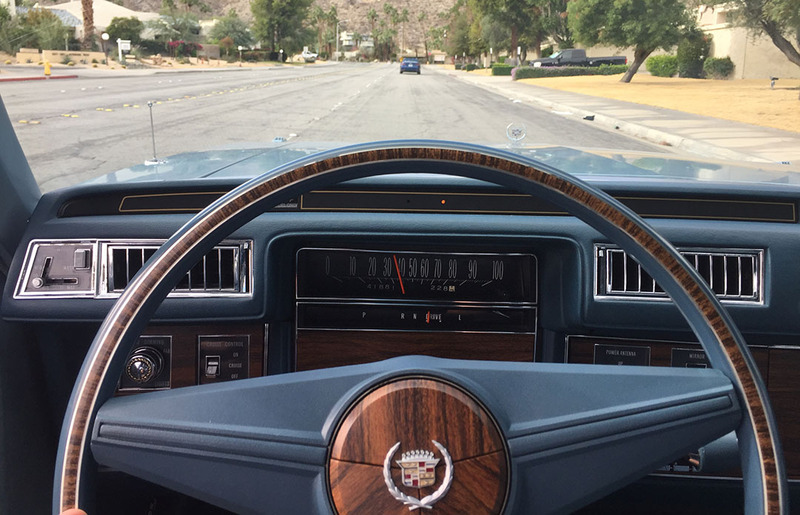 1976 Cadillac Seville which rode like it was on a cloud. 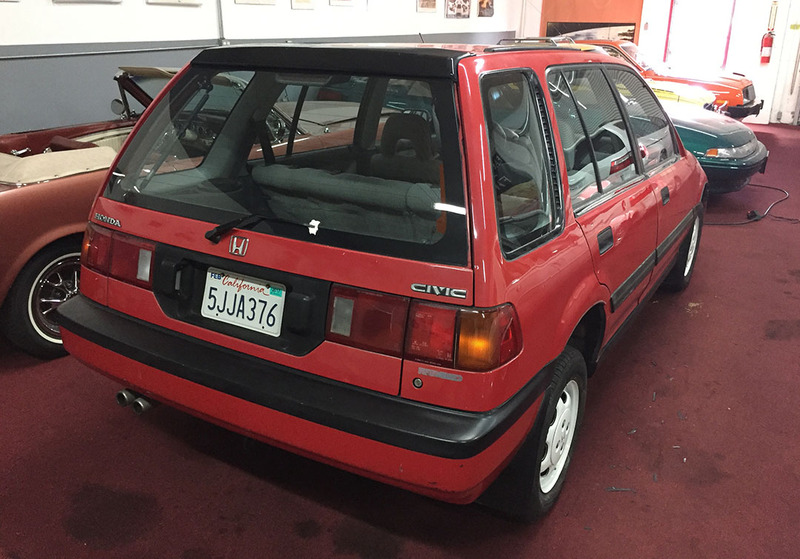 Also checked out Scott’s latest toy: a 1991 Civic “RealTime 4WD” wagon that he’s going to restore. Many thanks to Scott and Sandy once again for their hospitality. Finally today – I’d like to make a quick introduction to my friend Melissa, who has launched her own blog. It’s called “Working from Home.” In today’s workplace, thanks to the advances in telecommuting, you can be in virtually any part of the world and still be connected to your day job. I’ve participated in conference calls from the road, logged into my email from airplanes and hotel rooms, and been on Skype meetings while in another state. It’s starting to matter less and less that you’re seated in desk 4S018 at Phoenix Plaza Corporate Office staring at 4 cubicle walls. Case in point: I worked with Melissa on a daily basis for over 4 years, but I never met her. She was over 2,500 miles away at our Rhode Island office and I was based in Scottsdale, Arizona. Did the geographic distance make us any less productive as coworkers? I honestly don’t think so. And herein was born the opportunity for Melissa to create an outlet where she could share some of her learnings over the many months of working from home. Be sure to check out the article “Are You On Mute?” under the “Real Work” section. It’s one of my faves. This entry was posted on November 20, 2016 at 9:53 am and is filed under California, Car Show, ILX, Integra, Maintenance, NSX, Road Trip. You can follow any responses to this entry through the RSS 2.0 feed. You can leave a response, or trackback from your own site. That building on Pico in the photo from the 50’s… Checked out the beauty with the fins in the parking lot. Nice! Tech Noir is the nightclub where the Terminator first encounters Sarah Connor. She makes a call from a pay phone to the cops and states where she is. The inspector says the place is on Pico. Carlos please correct me if I am wrong! Tyson, it’s no coincidence that the word ACURA is contained in existing sign on the Honda Museum site. Wouldn’t I just love to create a replica of the original space with all those old small displacement bikes! Hey Pam, thank YOU for reading! And I know – pretty crazy that the sign basically says ACURA and just needs a few letters chopped out of the middle. It’s a sign – I need to lease the space and do something with it 🙂 Hope you had a great weekend. Yes. Technoir was on Pico. 🙂 Right Tyson? You know what me and Bowtie are talking about? Okay, I googled it. A night club from Terminator?? 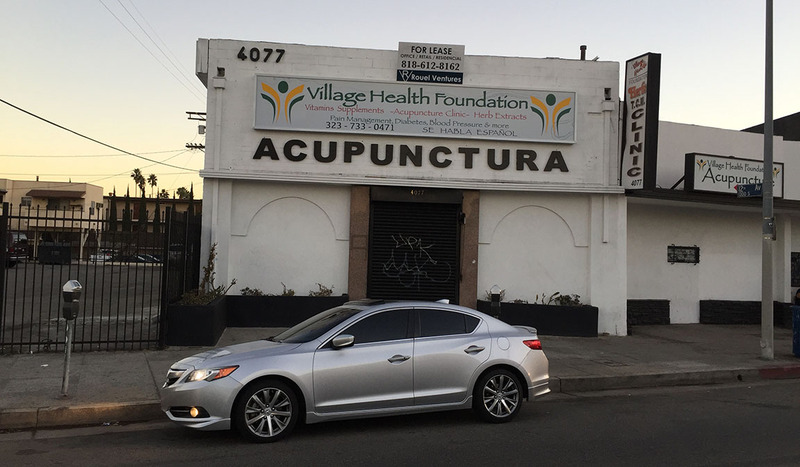 Did you notice that in the third picture from the top, the name of the store is Acupunctura? If you take part of the middle letters out (take out “Punctu”) what you have left is “Acura”! I should have done them a favor and peeled a few letters away from the sign to make it say just ACURA. Very cool series of updates and photos. When I think of the size of my local Honda dealership, that original storefront would probably fit within the service area waiting room of the dealer. With your NSX, is the timing belt service an engine-out job, or can it be done like any other V6 Honda/Acura? The TB/WP on an NSX is apparently pretty straightforward (luckily) and the interval is every 90,000 miles so not too crazy. The guys at Science of Speed are really thorough. They have come up with aftermarket and reproduction parts solutions for things that Honda has discontinued. It’s scary how many OEM parts are no longer available for a 20+ year old NSX! Have to admit, I chuckled at the Vig picture. Was a fun time in LA. 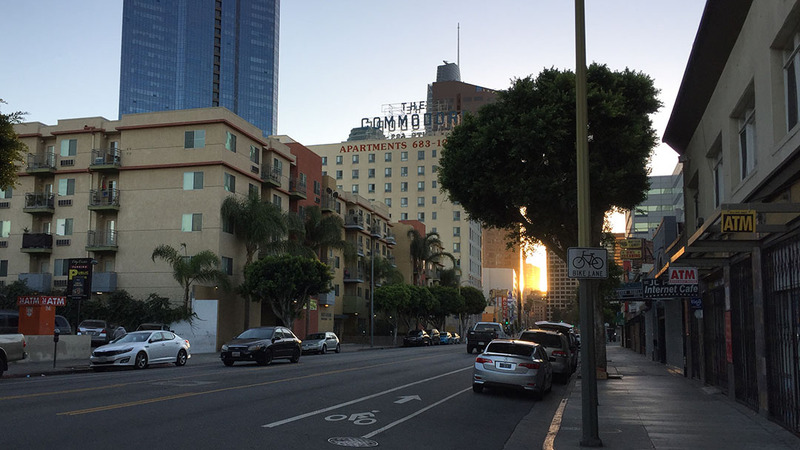 The Streets of LA have some tales that shall never be told! Haha. Yes it was way fun. Let’s pool our money and buy that old Honda dealership! Happy Turkey Day! I’m down! I’ll split it between you and Hondapro Jason. Happy Thanksgiving to YOU! Hope you get to see Mason. Many good diverse topics here again Tyson, nice job. Someday I’ll have to get off the bench and make it out to the Detroit Auto Show it’s the last major domestic venue I’ve not attended. You’d think by now they’d schedule it @ a better time of year than January. Sort of like planning a vacation to Buffalo in February… who dies that! ?